100+ page step-by-step workbook for teaching syllabication! These comprehensive reading strategy worksheets guide students through direct instruction on each division type and pattern. 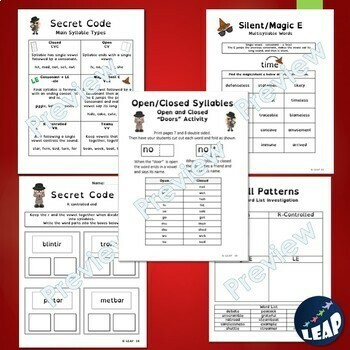 Sequential syllabication examples and practice of each pattern includes 2 and 3 syllable nonsense words, high frequency words and more advanced words. 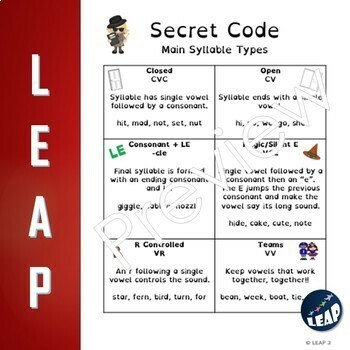 Visual syllabication rule charts are organized by syllable division: VCCV, VCCCV, VCV, and VV and syllabication pattern: Magic/Silent E, R-Controlled Vowels, Vowel Teams, and –cLE Endings. Students can track the patterns they have learned and can use the charts to identify the patterns that they find in words. Based on the frequency of words encountered in the written English language, the syllabication order of introduction is as follows: VCCV, VCCCV, VCV, magic/silent E, R-Controlled, vowel teams, cLE, VV. VCCV word lists for real, nonsense, high frequency, and advanced words. VCCCV word lists for real, nonsense, high frequency, and advanced words. VCV word lists for real, nonsense, high frequency, and advanced words. Magic E word lists for real, nonsense, high frequency, and advanced words. R-Controlled word lists for real, nonsense, high frequency, and advanced words. 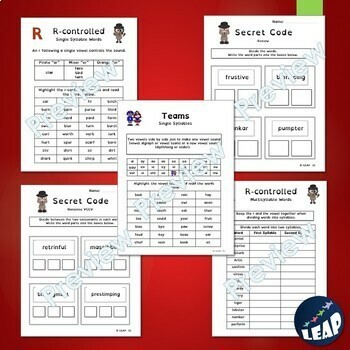 Vowel Team word lists for real, nonsense, high frequency, and advanced words. -cLE Ending word lists for real, nonsense, high frequency, and advanced words. VV word lists for real, nonsense, high frequency, and advanced words. 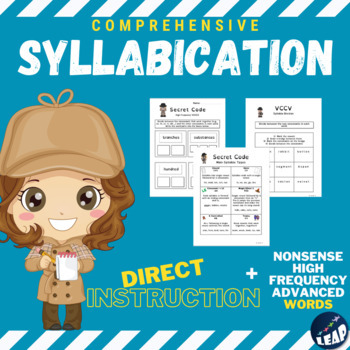 These syllabication lessons and worksheets are compatible with Orton-Gillingham instructional practices.